We are proud to use Aussie built Fragtag hardware developed locally over the past 12+ years. 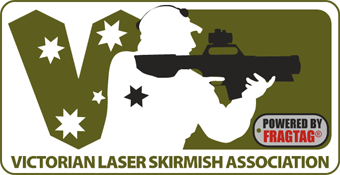 This is the same kit the Victorian Laser Skirmish Association use for their military simulation, no kiddies space phasers here. Put your sensor on your head, aim down the red dot sight and start fragging. Realistic look and feel - Most other systems have flimsy unrealistic looking guns, with us the moment you pick up your weapon you feel part of the game! True Near Miss Detection - Our sensors have intelligent near-miss detection, that will play a richochet sound effect. This effect enhances the fun factor of game play and will have you diving for cover, heart pounding. Variable Damage and Weapon Modelling - Although the shell looks the same our guns can be configured to mimic one of over 12 real world firearms. Each with differing damage, fire rate, reload time, ammo capacity and sounds.